A late brace from Eastleigh's Paul McCallum saw the Spitfires come from a goal behind to beat Dover 2-1. 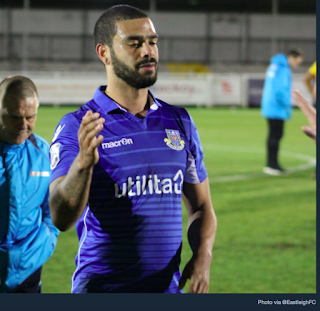 McCallum scored twice in the last six minutes to help Eastleigh to their first win in two months and the result sees Andy Hessenthaler's side move nine points clear of the drop zone. Eastleigh fell to a third successive away defeat in the National League with a 3-1 loss at Tranmere. Eastleigh drew 0-0 at the Silverlake Stadium for the second game in a row after three weeks without any football due to adverse weather. Eastleigh: Graham Stack, Gavin Hoyte, Sam Wood, Sam Togwell, Reda Johnson, Ayo Obileye, Andrew Boyce, Mark Yeates, Cavaghn Miley (Sam Matthews, 68), Ben Williamson, Paul McCallum (Chris Zebroski, 78). Subs (not used): Ryan Cresswell, Ryan Broom, Danny Hollands.